With WrestleMania weekend taking place I thought it be a good idea to pop up this “Road to WrestleMania” WWE Slam Crate powered by WWE. Just from the title alone you know it will be chock full of that long to get to the biggest stage of all which is WrestleMania. First off is an exclusive T-Shirt by the former architect of “The Shield” and former WWE & US Champion Seth Rollins. Seth had one of the most intriguing Money in the Bank cash-ins when he threw himself into the main event of WrestleMania 31 which featured Brock Lesnar vs Roman Reigns. He would go on to win that match with a curb stomp to Reigns and cement himself with his own WrestleMania moment. 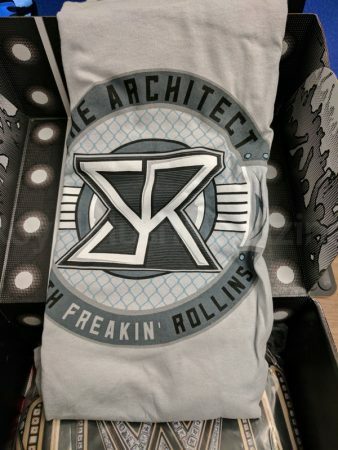 This t-shirt debuted on a Jan 16th episode of Monday Night Raw which him with former teammate Roman Reigns and the super underdog known as Sami Zayn. Speaking of cash-in on championship titles this next item is a waist pack or what most will call a fanny pack to replicate wearing the WWE Title or as they like to call it now the World Heavyweight Championship. It has adjustable straps so you can wear it over your shoulder or around your waist. Inside you can store some of your favorite WWE stuff such as these Topps Cards that came along with the Slam Crate this morning. If you aren’t into throwing your cards in the bag you can easily put in one of the most killer WWE wrestlers to ever pick up a mic which is “The Rock”. 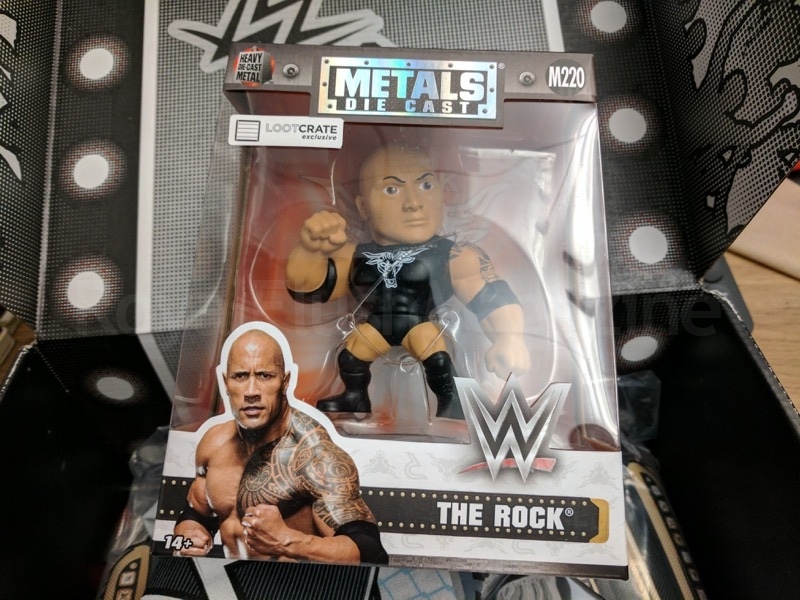 Coined as the most electrifying man in sports entertainment” this Metal Die Cast of “The Great One” features his signature tats and brahma bull insignia. It also has a removable stand as well. 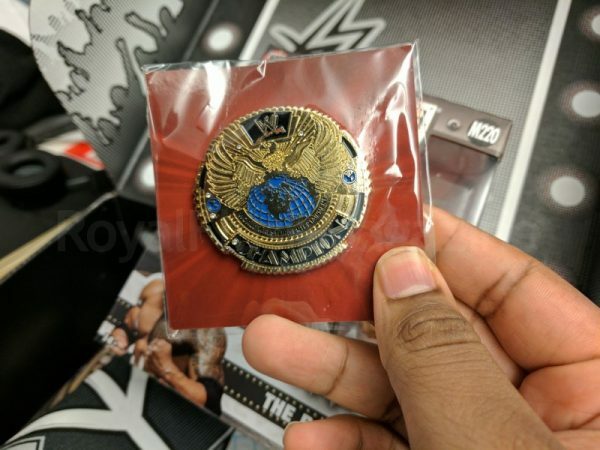 One of the coolest things in the box and shows your following as a WWF/E fan is this enamel pin of the Attitude Era of the WWF/E Championship. This belt has been hoisted into the air by greats such as “The Rock”, the Heartbreak Kid Shawn Michaels, Undertaker, even “The Game” HHH. As any old-school wrestling fan and they might coin this as one of their favorite titles. Also, included in the booklet is an interview with multi-time champion Charlotte and a full spread poster of The Undertaker on the other side.